Can we tackle obesity with a “Pudding Tax”? After the overindulgence of Christmas our tight belts, and even tighter bank-balances, are adding pressure to follow more healthier lifestyles. So, would a “Pudding Tax” on treats help us stick to our resolutions? Could it even go as far as improving the future health and finances of the UK? Despite the apparent efforts of an extremely lucrative health industry the nation’s failing health is becoming rather costly. And while our average waistlines are widening the associated costs are making our collective finances shrink, making obesity a very expensive issue. It is not just the fact that treating obesity costs the NHS billions each year. The real costs are impacting millions of UK families directly: from shortening life spans, expensive treatments, to the loss of earnings, lower self-esteem and underlying mental health issues. Much worse is the fact we are passing on these problems to our children, and future generations will bear the cost. Numerous studies have been conducted into obesity such as the government’s “Health matters: obesity and the food environment” estimated the overall cost of current obesity levels to wider society at £27 billion. More recent statistics from PHE (Public Health England) paint a shocking picture of record high levels of obesity in children. Severe obesity among year 6 children (aged 10 to 11) has increased by more than a third since 2006 to 2007 to 4.2%, its highest rate ever. With childhood obesity already one of the UK’s biggest health problems, ranking the UK among the worst in Europe. 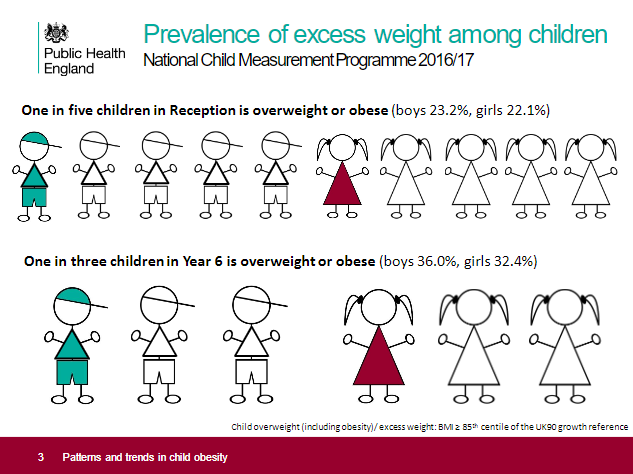 *Image from PHE Patterns and trends in child obesity report 2018. PHE also points out that nationally the level of consumed sugar has risen across all age groups. With poor diet choices, almost 7 in 10 men and 6 in 10 women are now diagnosed as overweight or obese. While the root causes of obesity in individuals are many and varied, such large numbers suggest that there are common factors at play. Shocking findings show that half of the sugar in children’s diets comes from sugary drinks, sweets, biscuits, cakes, puddings, yoghurt and sugary breakfast cereals. And while drinks manufacturers have been cutting the sugar content, the treats are actually getting sweeter. Acknowledging the growing problem, last year the UK Government introduced the ‘Sugar Tax’, placing a new levy on drinks with a high levels of added sugar. A drive focused on encouraging soft drinks manufacturers to reduce sugar content in their drinks, but also a means of raising government funds to offset the rising costs of the UK’s sweet tooth. The tax, in fact, raised close to £154 million by November 2018 with the proceeds funding vital healthy school breakfast clubs and sports in schools. If Sugar Tax works, should it be extended? Alison Tedstone, chief nutritionist of PHE, has suggested introducing a “Pudding Tax” as the measure needed if food producers failed to reduce sugar voluntarily. In May 2018, PHE published a report assessing progress in the first-year sugar reduction programme, which showed a fall of just 2 per cent, against a first year goal of 5 per cent.